It is still "The Holidays!" It really is! So all of you who have all of your Christmas put away and have been cleaning up a storm, better hold your horses. Today is the holiday called “The epiphany” also known as “The Day of the Kings.” So, although we have never celebrated this holiday in our home before, in order to completely celebrate the holiday season, our Christmas decorations are still up, and more importantly….our Christmas cards were mailed today!!! And I’m hoping that those who don’t share my feelings about the “Day of the Kings,” will give me points for creativity that will make up for lost points for tardiness. 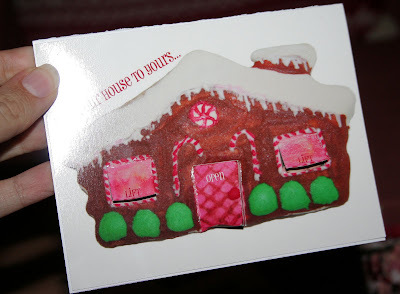 The front of the card is a photo of one of those crazy cookies I painted last Christmas, with some fun lift up flaps. Inside features some photos of our family around the fireplace, looking cozy, and being goofy. By the silly one you read “Oh there’s no place like home for the holidays!”, and our main greeting says “Wishing you all the comforts of home this holiday season!” My theme for Christmas this year was “Home for the Holidays” (yes, I tend to have themes for each holiday. Sounds weird, but helps me. I plan to post more about this, but probably not until we are closer to next Christmas). I’ve wanted one of those cool personalized stamps, but have never been able to spend the money on one, so I designed this in my photo program and ran the envelopes through the printer. …In the meantime, happy Epiphany! Happy Epiphany! What cute cards. You are so clever! Very cute cards. I like to get cards after the first of the year. It seems my mailbox only has bills that time of year. You did a great job. cute cards. 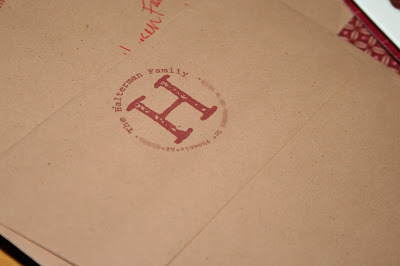 and I love the address idea. 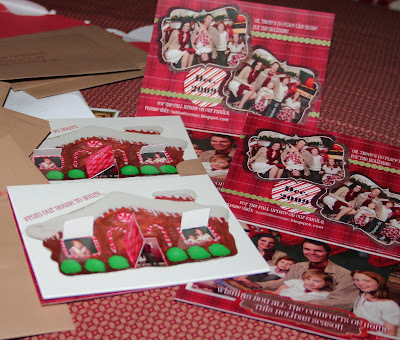 I need to make one of those for my cards next year! 🙂 Can't wait to hear your neighbor gift plan. I'm always trying to get things done ahead of time for Christmas and somehow never quite make it. Such cute stuff. Thanks for sharing! I love the idea of having a Holiday Theme. How organzed! Love your card. Very cute idea too.